Win the Ultimate VIP Travel Experience to Istanbul! IF WE GAVE YOU THE ULTIMATE VIP TRAVEL EXPERIENCE FOR TWO FROM MONTRÉAL TO ISTANBUL, WHAT WOULD YOU DO? WHO WOULD YOU TAKE? Istanbul is an exciting blend of old and new, modern and ancient, it’s also a new travel hot spot. The city recently beat out Paris and London as the top ranked world travel destination (2014) by Trip Advisor. A trip this special deserves a special travel companion, a Travel VIP. Turkish Airlines and Aréoports de Montréal thinks so too, and want to send you and your VIP on an ultimate holiday experience to Istanbul Turkey. Click here to find out all about this exciting contest. The contest asked the question and I had my answer immediately. My awesome mom is one of my favorite and constant travel companions. She put me on a plane to Germany at the ripe old age of two and many years later we’re still wandering the world together. 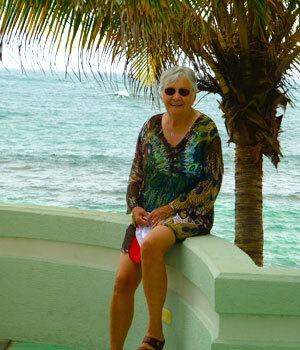 Here’s a photo of mom on a trip we took together recently. Share your short story about your deserving VIP by March 8th, 2015. The panel of judges from Turkish Airlines and Aéroports de Montréal are looking for original and creative entries! The reasons my mom would be my travel VIP aren’t so creative or original, but they come from the heart. Simply put, she is my travel VIP because she is one of the nicest people I know. She’s a fun, brave and happy woman. She has accomplished so much since her early beginnings in Northern Quebec. She’s experienced life as a teacher, waitress, preacher, librarian and mother. She raised four wonderful children, in difficult circumstances, and we all love her to bits. For the last while she’s been busy taking care of my Dad after he suffered a heart attack. Now our holidays together are also her stress relief, her well deserved ‘me time’. I can imagine how much fun she would have haggling for the best price in the Grand Bazaar (she does love her bargains! ), or putting on her walking shoes for a stroll along the Galata Bridge. Who would you like by your side on this fantastic Istanbul holiday? Click here to get started on your grand adventure. Five finalists will be selected on March 11, 2015, and then the voting public will get to pick their favorite via social media. The final winner of the contest will be announced on March 25, 2015! Before the contest closes I’ll be hosting a twitter chat with a few of Canada’s top travel bloggers. 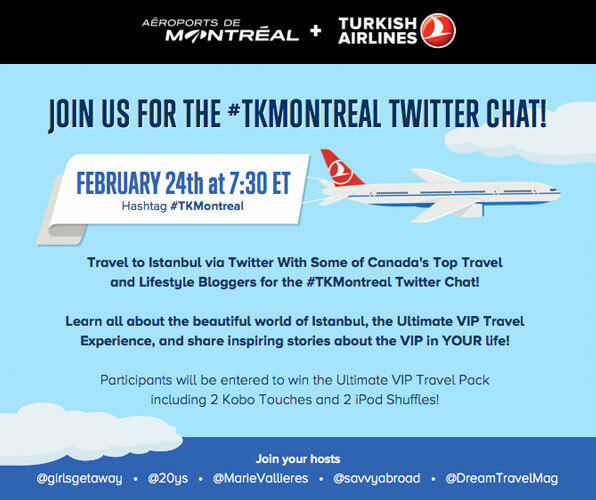 We’ll be talking about all things Istanbul and VIP travel companions PLUS we’re giving out some awesome prizes. I hope to see you’ll there!